There is a fashion taboo in the influencer community (or social media for that matter) that repeating looks or reusing pieces from previous ones are huge no's. And I am here to say to that...GIRL BYE! With fashion repeating itself so often, it's nearly impossible to accumulate so different pieces and getting rid of them after being digitally "caught" wearing them without going BROKE. Although sponsorships & PR packages are another story, spending that much on a regular basis just doesn't sit well with me. 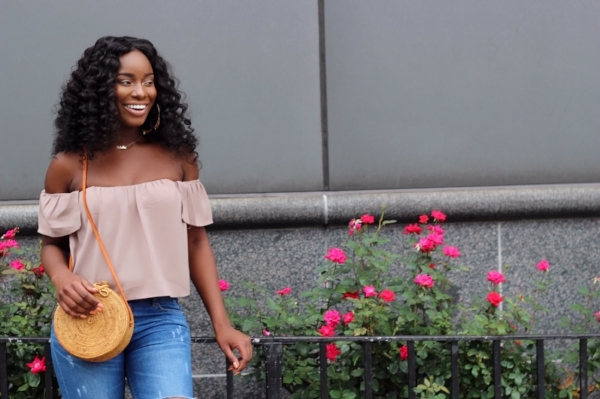 My rule of thumb is keeping and repeating the basics (neutral shirts, dark and light washed jeans, muted toned heels) while mix matching the statement pieces (like this bag you've seen me post about in my FESTIVAL INSPIRED LOOK) for recycled looks. One thing blogging as taught me after all these years is really budgeting and staying within my means. When my income grows, my budget grows but that doesn't mean I get to toss away pieces I have purchased just to keep up with other bloggers! As my "FINDING YOUR PURPOSE" post emphasized, do what works for you and follow your own rules!